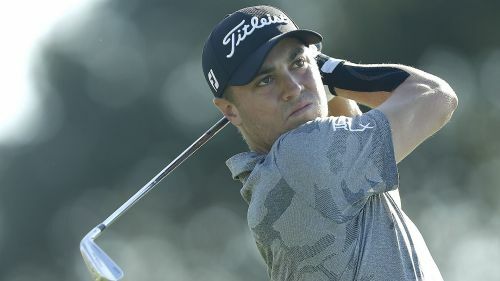 The United States Golf Association (USGA) wants to talk to Justin Thomas after he questioned a penalty handed to Adam Schenk at the Honda Classic. The USGA was responding to Thomas' tweet that called out the organisation for not effectively communicating new rules to golfers. Thomas' words were just some of the backlash the USGA received on Saturday after Schenk was assessed a two-stroke penalty for a rules violation in the second round. The violation occurred when Schenk's caddie stood behind him once he was in his stance on the 17th hole on Friday. The penalty was not announced until Saturday and it ended up changing the bogey Schenk carded on the par-three 17th to a triple. "Justin, we need to talk. You've cancelled every meeting we've planned with you, but we are reaching out again," the USGA wrote to Thomas on Twitter. "We were at the first five events, and tournaments last year, and your Tour has had a seat at the table for seven years. We'd love nothing more than to give you a seat. Call us." Justin, we need to talk. You’ve cancelled every meeting we’ve planned with you, but we are reaching out again. We were at the first 5 events, and tournaments last year, and your tour has had a seat at the table for 7 years. We’d love nothing more than to give you a seat. Call us. After the Schenk announcement, Thomas took to Twitter using the hashtag "#growthegame". In the thread, he responded to multiple tweets clarifying his stance. "My problem with the rule is that unless a caddie is clearly lining a player up [which is very obvious], I don't see how there's any benefit to it," he wrote. "Doesn’t make the game any better in my eyes. That being said, we know the rule and have to be careful to go by it." It appears the two parties have set up a meeting with the USGA again tweeting: "Justin, thanks for connecting with us offline. We look forward to meeting with you and talking through these issues. It's clear we both want to do what's right by the game."